In this episode we travel to Allendale, South Carolina to visit our old friend Hayward Simmons at Cedar Knoll Hunting Lodge and Lakeview Plantation. First we’ll try to plink a big hog in the evening, then in the morning, head out for some quail hunting. Well folks, welcome to our show this week. We’re in, actually Allendale, South Carolina, not too far out of Fairfax. We’re at Cedar Knoll Hunting Lodge and Lakeview Plantation, a good friend of mine and, we haven’t been back down here in probably 15 years. Hayward Simmons, the owner, has allowed us to come back, wants us to come back and do two things on this week’s show. We’re gonna try and kill a hog here this evening, he’s got some big ones down here. Hopefully we’re gonna get a chance to plink one of ’em. And then we’re also going to do a quail hunt. Hayward offers deer, quail, and also big massive hog hunts down here on his plantation. He’s been here at this location for over 34 years, and it is still going strong. Well with that, we’ve gotta get in the stand, the sun is settin. Well, I’ll tell you what, hogs are just around the corner. We got this and a whole lot more on this week’s Bob Redfern’s Outdoor Magazine. Stay with us, when we come back, we hope to have one down. Beautiful right there. What I thought of this league he might’ve been a jay. Fish on. Doubled up doubled up, ain’t ya? We’ve got him illuminated here. Got a pretty nice sized hog just decided to come out. Folks, I’m using my ATN night vision scope, mounted on my Browning BAR 308 caliber. It’s a great… tool option here for hog hunting at night, here down at Cedar Knoll again. The guys have really got these stands in strategic places. He’s not sure if he’s ready to come out. All right, come on guys. Alright, he’s getting a little bit braver. Come on. Come on. Still something he’s not liking out there. Okay, maybe it’s the light. No, he’s looking right at it, okay, here we go. Now maybe we’re… gonna settle down here. Alright, this may be my shot. Alright here comes another one, he’s a little bigger. This one here is probably a little over 200. But again at about 195 yards it’s hard to tell. Alright, don’t leave. I’d almost rather like to take the other one behind him but that’s okay. Sometimes if you wait too long, they decide to scurry and not come back so. Alright, maybe this one’s gonna cooperate here. Hog down, hog down. Well folks, that was our hog hunt for this afternoon, we came down early, because we really were coming down to quail hunt with Hayward Simmons. It’s been probably, oh gosh, maybe 15 years since we were down here last. Came down did some hog hunting and Hayward invited us down to come, as you saw, and looked at thermal video, we had a group of hogs down there, probably 150, maybe 200 yards. Just an opportunity, just to plink something here. Really tomorrow morning though, we’re gonna be doing some quail hunting with Hayward, but right now, we’re headed on back to the lodge, and we’re going to have some fried chicken tonight, take off our shoes, relax. Cedar Knoll Hunting Lodge, right down here in Fairfax, Allendale, South Carolina. Hayward Simmons and all the staff down here do such a great job, again, log on to bobredfern.com, go to Bob’s Top 16, you need to come down here. Quail hunt, hog hunt, deer hunt, if you got horses, hey, come on down, they’ve got tons of trails down here. Matter of fact, you can just camp out. He’s got RV hookups, he’s got everything down there you need. It is an outdoorsman’s playground. With that, I’m going on back to the lodge, and tomorrow morning, it’s gonna be quail hunting on the ground, 38 degrees, I can’t wait. [Narrator] For more than 30 years, Cedar Knoll Hunting Lodge has been committed to delivering the best hunting experiences for their clients, from around the nation. Cedar Knoll offers the hunter the best in low country deer and hog hunting. Hunting is done on 3000 acres of intensively managed prime low country habitat. And Cedar Knolls White Tail Herd has benefited from a year round supplemental feeding program since 1985, that has produced the highest concentration of quality white tailed deer in the nation, as well as the highest sustained harvest on record in the White Tailed world. Now is the time to book your deer or hog hunt. Go online, at cedarknoll.com and experience a true South Carolina low country deer or hog hunt. Bob Redfern’s Outdoor Magazine brought to you today by the South Carolina Department of Natural Resources, Life’s just better outdoors. By Berkley, catch more fish with Berkley fishing products. By Ranger Boats, still building legends one at a time. By Browning Ammunition, Browning, the best there is. And by Southern Woods Plantation, a place where the grandeur of time’s past, can still be experienced today. Welcome back to the show folks. After a great night’s sleep, fried chicken dinner, I’ll tell ya what, a hog hunt last night over at Cedar Knoll Hunting Lodge. I’ll tell ya what, I got two guys today that, well Hayward Simmons, you know Hayward from previous years, he’s over here on my far left. He’s gonna be one of my wing men today, and then we’re over here doing a little quail hunting with a good friend of his, Jimmy Polk at Legacy Hunting. So, we’ve got the best of both worlds. As promised, a quail hunt down in Hampton, South Carolina, Cedar Knoll Hunting. I tell you what, they’ve got it so going on over here guys, I’m telling ya. I just want to thank you guys for taking the time to have us here. Hayward again, it’s always good to have you. Now the good thing about this guy is, okay, the last time I was down here, I didn’t get him behind a bird dog, okay, and now, we’ve got him hooked up with you. Tell me just a little bit about what we’re gonna see this morning over here at the quail operation. [Hayward] There ya go, yeah, yeah, yeah. We do an early release program and put out and supplement all during the year, so we gonna see probably a lot of birds, and have a real good time. And I hope they gonna fly real good. Ready to go kill a bird? I’m ready to go kill a bird, okay, and I don’t want you out here to embarrass me. Okay, alright man, let’s go to it guys, thank you. All right Hayward. [Jimmy] As I was lookin’ here so I’d say the birds are in between. Y’all wanna come on up just a little more here. We gotta get you close he’s shootin his little small, Hayward, he’s already at a disadvantage with little gun now. [Bob] Now I can see, this is gonna be a tough crowd this morning. [Bob] Don’t be too hard on me Hayward. [Jimmy] Other people behind, everybody ready? Go buddy, find ’em Blue, find ’em. [Bob] Now we got little Blue. I don’t believe they have Blue. [Bob] We fixin’ to find ’em. [Jimmy] Where they at Blue? Oh, they here? [Bob] I got my two. [Hayward] I didnt’ get mine. I winged ’em both. [Bob] Alright. I got my two, Hayward. [Hayward] Here I am, at a disadvantage already. [Bob] I’m working on it. [Bob] That is a beautiful covey rise right there now. [Bob] Hayward, that’s some beautiful points right there. [Jimmy] Find ’em Blue; they’re here. [Bob] Look at Blue. I tell you what, he wears me out just looking at him. Look at him! [Jimmy] He wears me out too. [Bob] Two down. I got my two! [Hayward] Man over here is showing me off. I don’t know what this fellow over here is doing. [Hayward] No, I just shot one. [Hayward] I walked a little more Blue. [Bob] Come here now guys. What uh– You know what Jimmy? [Jimmy] I think you better load up. Yeah man, come here now. You know, that’s what it is. That’s what it is. Look at ’em, they’re still getting up. What have I gotta say? You know though guys, I will tell ya I love quail hunting and, I love going to great places to hunt. And obviously, this is one of the best. Hey yes to dog working and the hard time I give people is so much fun. This, I just tell ya, I can’t explain to people sometimes. They watch the show, and they see me laughing and having a good time, but they need to experience it. And, you know from Cedar Knoll now here, to Legacy Hunting, you guys have a great relationship and partnership. That’s what’s so special. I’ll tell you what, Bo, and there’s birds still flying out there. [Narrator] Legacy Hunting Shooting Preserve in Hampton, South Carolina offers traditional quail hunting, in the South Carolina low-country. Legacy Hunting, in consultation with wildlife experts, manages a diverse property. If you’re looking for a new quail hunting destination or wanna introduce new hunters to the pleasures of quail hunting, then visit legacyhunting.com Legacy Hunting is proud to carry on our father’s legacy of hunting traditions. Good times with friends and family. While walking behind some of the best bird dogs you will find anywhere in the country. Go online and book your trip today. [Narrator] The Sportsman’s Table is brought to you by the South Carolina Department of Agriculture. Whether you live in South Carolina, or out of state, be sure to buy South Carolina grown meats, vegetables, and fruits. Make sure your food is South Carolina certified. It’s a matter of taste. Welcome this week folks, we’re in Murrell’s Inlet, South Carolina at a beautiful, Wicked Tuna restaurant right here along the coast. And, joining me today, and I tell ya, It’s a pleasure to have him, is the executive chef here at Wicked Tuna, it is Patrick Fowler. And, I tell you what, Patrick man it’s great to meet ya. Great to have on the show, my friend. Well listen, staple, this is what you guys do here at the Wicked Tuna. We uh, well right now we have our American Hog Snapper, caught right off the coast of South Carolina. We’re just gonna cook it over some root veg, it’s all grown here around the coast, and we are just going to cook it up. Alright man, well let’s get started. I can’t wait. I’ll tell you what, I love snapper. Okay so, two filets, gonna salt it up a little bit. Put a little olive oil in there. Okay, yeah there you go. Ahhh yeah. good crust in there. Gotta let it slip and slide around there a little bit. Now how long are you gonna let this sear for? Ah, we’ll sear it both sides, about three to four minutes. And, it will be ready to go. [Bob] Oh wow, that’s awesome. And then so, you know when ya cook fish, and you know most of you executive chefs tell me, don’t overcook it. So when you guys are preparing it for the restaurant, say I came in to order it, it’s the same? Yes sir, every time. What we like to do is, we dust it a little bit in a flour, and what that does is, it keeps the moisture in it so it’s nice and fresh and juicy. So when you actually bite into it, it’s not dry. There you go. Yeah, nothing’s worse than dry meat. We’re gonna flip that over. [Bob] Patrick, here at the Wicked Tuna man, I tell you what, you guys do fish right. Yes sir. Alright, we’re gonna go ahead and start plating. Right here, I have a mixture of our root veg. We have fingerling potatoes, butternut squash, sweet potato, and a little bit of cauliflower. We’re roasting ’em off in some seasoning. [Patrick] And then, we are just going to plate this right here. [Patrick] Just like that. We’re gonna take this, this beautiful Hog Snapper, we’re gonna put it right here on the plate. We’re gonna garnish it with a little bit of lemon, garlic cream. [Bob] Oh wow! Mmmm. Man, that looks wonderful. [Bob] There you go. We’ll add a little but of greenery to it. Thanks for having me. Beautiful restaurant. Folks listen, the next time you are in Murrell’s Inlet stop on by the Wicked Tuna right here. This guy, and all his staff, will cook you up a meal you will never forget. And, remember, buy and eat local. It’s simply a matter of taste. Log on to certifiedscgrown.com and see what’s fresh on the menu for yourself. We’ll see you right back here again next week, on another great recipe on the Sportsman’s Table. Mmmm! To find out more information on food that’s fresher and tastier, go online at certifiedscgrown.com. 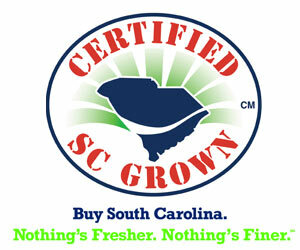 Buy certified South Carolina grown products. It’s a matter of taste. Bob Redfern’s Outdoor Magazine is brought to you today by, Chevrolet. The official vehicle of Bob Redfern’s Outdoor Magazine. By the South Carolina Department of Agriculture. By South Carolina; it’s a matter of taste. By Pennington Seed, the leader in outdoor forage products. By Browning, Browning, the best there is. By South Carolina Embroidery and Screenprinting. And, by Back Woods Quail Club. Offering southern style hunting, and an array of exciting and challenging clay target shooting sports. [Bob] You all ready Hayward? [Hayward] I don’t know, I’m not sure. I’m not going to make any promises. [Bob] I can see right now. Hayward’s trying to get me behind trees. I don’t know what that’s all about. Uh, I had no shot on that one in the back. And, I will not turn around and do it from the rear. Cause there’s too many people in the rear with a gear. [Jimmy] Yup. Find ’em Blue. [Bob] There may be some more in there. [Jimmy] Come on, Blue! Come on little buddy. [Hayward] That’s cute right there. [Bob] Wait a minute, that’s got Hayward written all over it. [Jimmy] He’s going back in there. [Jimmy] They knew it was coming already. [Jimmy] I knew you was gonna get ’em Blue. [Hayward] Still got that bird buddy. [Hayward] He ain’t done yet. Is there more in there buddy? [Jimmy] Blue, come here little buddy. Oh, drop. Drop! [Jimmy] Is that it, anything else in there? [Jimmy] That all there is buddy? [Jimmy] Ya killed a tree Hayward. [Jimmy] Do you see that Hayward? [Hayward] Where’d they go? This ain’t Bob’s first rodeo. [Jimmy] Look here little buddy. Bring that bird back! [Bob] Oh man now that’s special bird right there. Let’s see that, would you? Oh man! Really special bird right there, through the trees. [Jimmy] Make me look good Blue. [Jimmy] Bring it down a ways Blue. That’s right, come around. Come here by There you go, get him. Get him, where’s he at? Where’s he at Blue? [Jimmy] Tired of watching you, Blue. [Bob] I’m telling you, he’s a looking. There he goes! Take ’em Hayward! [Jimmy] Blue, I’m sorry baby. That’s all you can say when stuff like that happens. [Bob] Come here boys. Come here boys. Now wait a minute, I wanna take just a pause for the cause here. You wanna hook up Blue. Well you know, I’ll tell ya You know hunting behind pointing dogs is so special, but I tell ya, when you’re using a flusher, like this okay, and you don’t see that rarely up out of Georgia. And you guys have taken that technique, and I’ll tell you what Blue, I know buddy, tell you what, anytime they ain’t treating you well and you wanna come on up to Blythewood, we’ll take ya up there buddy. You know, that’s one of the special things, A lot of guys don’t understand. When you’re doing pre-released birds, then you’re doing supplementation. This is very key. Not only for safety, but it just makes the excitement much, much better. You know I’ve hunted years ago, guys were kicking up the birds, and swatting ’em with this and that. But, you have really done a very very good job here Jimmy. When little boy Blue come along, he gives her a break, but little boy Blue on an average day, he has to rest for about an hour or so. One of my friends calls him the dog with no legs, cause he really has to work hard. Well now, Hayward listen, when guys come down and gals come, course, one of the great things about Cedar Knoll is you also offer the equestrian trails and all of that too. So folks can bring their Airstream, you’ve got an RV park. I mean, what is the capacity of the lodge, and just how many folks can you hunt normally during a hog and a deer season. We only take about ten hunters at a time. Just, you know, to maintain a good experience for the group that’s there. And then, uh, we do trail rides when we’re not deer hunting or hog hunting. And we have a campground capacity of 150 trailers. So we can take a pretty good size crowd. Well and one of the other things that’s so good about Cedar Knoll too, matter fact it’s become a winter location for a lot of field trial and dog trainers as well, which is very very special. You’ve got about sixty dogs over there right now with guys out of New York and the upstate where it’s just too cold. And then of course, you got this guy over here doing the bird operation. That’s what’s so special here. So if folks wanna, and I know they are gonna go to Bob’s Top 16 and they’re gonna come to Cedar Knoll. But, if folks wanna get a hold of you and Anthony and all the guys over at your place, how can they do that? They can go to cedarknoll.com And the phone number and email address are right on the website there. Check out all the information or go to our Facebook page South Carolina Outfitters, Cedar Knoll. There you go, well now, Legacy Hunting, tell everybody they wanna come over here and do a beautiful quail hunt. Yes sir. Okay, and then stop off and do the hog hunt. Do the hog hunt. We can make it happen for both ways. Ours is the same thing, www.legacyhunting.com Facebook page is Legacy Hunting. [Jimmy] Well that was all Blue. [Hayward] Birds! Birds! Birds! There he goes! [Bob] Aw, got him– I got one! They all went your way over there Hayward. [Hayward] I didn’t do any good with ’em. [Bob] Well, I got one. [Jimmy] Blue, you got to watch the man on the left son. The man on the right don’t give you no worries. [Hayward] Good job Pete, bring it here. Pete, bring it here baby. [Bob] Oh, here we go! [Bob] Oh, there he goes Hayward. [Hayward] Nah, nope, all Bob’s. [Hayward] Bob’s giving lessons today. I’m just taking lessons. [Jimmy] Y’all know that safety let us know, he went straight up with that gun. [Hayward] I can even get over it. You know, you know Hayward you’re mind was thinking right, but the rest of it wasn’t working. Well folks listen, we’ve had a great time down here in Hampton, South Carolina today and Allendale. Cedar Knoll Hunting Lodge again, and legacyhunting.com just on to Bob’s Top 16, and go down and just see exactly for yourself what great hog hunting, deer hunting, and a quail operation these two guys have put together. They’ve teamed up. And, if you like to ride horses, bring your horses on down to Hayward Simmons’ place. Him and Donna will be standing there waving at you when you come in the gate. Well folks, as I like to say each and every week, the outdoors is my passion and I want it to be yours too. We’ll see you right back here again next week, on another episode of Bob Redfern’s Outdoor magazine. Alright Hayward, go on and do it again Bo, we got no more birds out here. Ah they are man, I’m telling you. This entry was posted in Episode and tagged allendale, Cedar Knoll Hunting Lodge, Hayward Simmons, hog hunt, hunting wild hog, Lakeview Plantation, quail, quail hunting, shooting, south carolina on 03/26/2019 by BROM. This week on Bob Redfern’s Outdoor Magazine, Bob takes us on an awesome opening day turkey hunt in South Carolina. Plus, we take a look at South Carolina’s freshwater coast. And on this week’s Sportsman’s Table, we feature a South Carolina certified shrimp and grits recipe. This entry was posted in Episode and tagged gun, hunting, rifle, shoot, south carolina, turkey, turkey hunt on 01/22/2019 by BROM. This week Bob heads to Latta, South Carolina to join a group of upland bird hunters that are keeping the tradition of training and showcasing their bird dogs to the next generation. if you are a upland bird hunter or enjoy watching champion dogs working in field trail conditions then you don’t want to miss this episode. This entry was posted in Episode, Featured Stories, Fox Sports Net - This Week and tagged south carolina on 06/25/2018 by BROM. We’re in Hilton Head this week and the fishing is fantastic! Did you know: Hilton Head Island, sometimes referred to as simply Hilton Head, is a Lowcountry resort town and barrier island in Beaufort County, South Carolina, United States. It is 20 miles northeast of Savannah, Georgia, and 95 miles southwest of Charleston. The island is named after Captain William Hilton, who in 1663 identified a headland near the entrance to Port Royal Sound, which he named “Hilton’s Head” after himself. The island features 12 miles of beachfront on the Atlantic Ocean and is a popular vacation destination. This entry was posted in Episode, Featured Stories, Fox Sports Net - This Week and tagged Atlantic Ocean, Beaufort County, Port Royal Sound, south carolina on 02/05/2018 by BROM. This week Bob will have a very special guest in the boat, Kevin Malone from Pure Fishing’s Abu Garcia! Bob and Kevin will be trying their luck with some fall inshore Red Fishing action on the coast South Carolina, a great destination for vacation and fishing. aWatch this week and see if Bob and Kevin can load the boat with the Bull Red Fish and talk about some new Abu Garcia tackle options at the same time!! This entry was posted in Episode, Featured Stories, Fox Sports Net - This Week and tagged Abu Garcia, Bull Red Fish, red fishing, south carolina on 04/18/2016 by BROM. This week Bob will showcase the South Carolina Aquatics Education Division of the South Carolina Department of Natural Resources, High School Bass Fishing Tournament. High School students from all over the state of South Carolina will be competing for the Palmetto Sportsman’s Championship title. Bob will talk to some very special guests as well as a great recipe on the Sportsman’s Table. This is truly a show you will not want to miss!! This entry was posted in Episode, Featured Stories, Fox Sports Net - This Week and tagged Palmetto Sportsman, south carolina on 11/23/2014 by BROM. This week join Bob and a group of NWTF members for “The Heat is On Sporting Clays Classic”, an annual event at Backwoods Quail Club in Georgetown, SC. We’ll also feature the new Browning Citori 725 Sporting 12 gauge shotgun and shoot with some very special guests in the hot summer heat of South Carolina. You won’t want to miss some really fun sporting clays action as we look to support the National Wild Turkey Federation! This entry was posted in Episode, Featured Stories, Fox Sports Net - This Week and tagged Browning Citori, NWTF, south carolina, sporting clays on 08/31/2014 by BROM. Spring turkey season can be a blessing or a curse…. As everyone knows hunting the eastern wild turkey can be a frustrating and/or rewarding experience. This week Bob is joined by Scott Rhodes from Oak Grove Plantation in Brunson, South Carolina, Scott will do his best to put Bob in the right spot to bag a southern spring gobbler. See if Bob can make it happen…..or not! This entry was posted in Episode, Featured Stories, Fox Sports Net - This Week and tagged hunting, south carolina, turkey on 06/07/2014 by BROM. Tune in and join us at our Chevrolet Destination of the week: Dewitt’s Outdoor Sports in Ellerbe, North Carolina. Joining Bob on today’s show is owner Chris Dewitt, his son Bobby and long time friend Chuck McDonald who is an attorney at one of the largest legal firms in South Carolina. Watch as Bob, Bobby and Chuck try their luck at quail and upland bird hunting at Dewitt’s Outdoor Sports Complex. We’ve also got a great recipe on the Sportsmans Table for Bacon Wrapped Duck Breast, so don’t miss it! This entry was posted in Episode, Featured Stories, Fox Sports Net - This Week and tagged Chevrolet Destination, Chris Dewitt, Outdoor Sports Complex, south carolina on 03/23/2014 by BROM.